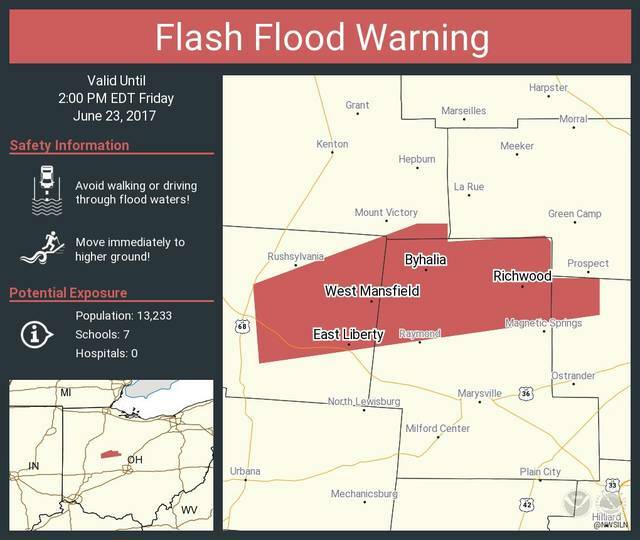 The National Weather Service in Wilmington has issued a Flash Flood Warning that includes part of Delaware County. The warning is in effect until 2 p.m. and includes the northwestern portion of Delaware County as well as northern Union County, eastern Logan County, and southeastern Hardin County. According to NWS, at 11:03 a.m., radar and automated rain gauges indicated that thunderstorms had produced heavy rain over the area. Up to 2.5 inches of rain have already fallen in some areas. Heavy rain continues to fall with another 1 to 2 inches possible. Runoff from this excessive rainfall will cause flash flooding to occur. Some locations that will experience flooding include Richwood, Raymond, Byhalia, Bellefontaine, West Mansfield, Rushsylvania, Valley Hi, Zanesfield, New Jerusalem, Somersville, Essex, and East Liberty.